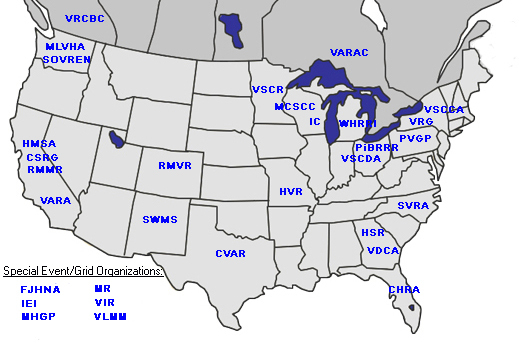 Want to learn more about the over twenty clubs and organizations which are members of VMC? The preservation and racing of these great vintage cars is a common objective of our member organizations. However, there is great variety in the various clubs and events. Years of eligibility, types of cars which are encouraged, and racing venues and tracks vary widely. There is something for everyone's taste within vintage racing. Please visit the various member websites to explore their sundry offerings. On the map, click on any acronym to take you to their website for complete information on their events, rules, and contact information. Or use the alphabetical listing below to find where they usually race, their website link and links to those race tracks. Victory Lane Motorsport Marketing, Inc.